The following families have genealogy eBooks on this page: Barksdale, Currier, Folsom, Garland, Geer, Grow, Ingalls, Luther, Marshall, Mell, Parlin, Plimpton, Powell Book 2, Spencer Book 2, Starling and Umstead families. Welcome to Bookshelf 18 at Hawkeyes Trading Post! 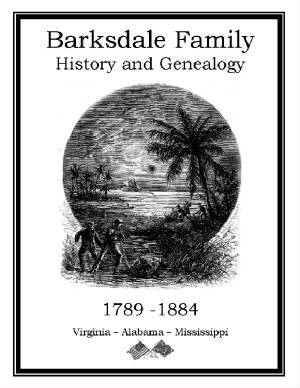 Barksdale Family History and Genealogy. PDF eBook English 3.20 MB. 1895. A brief 95 year history of the Barksdale family from when they arrived in Virginia, through the War Between the States, into the American industrialization era. A fine Southern family with deep roots of patriotism. This is a must for any member of the Barksdale family interested in their genealogical heritage and roots of Southern hospitality! Price $6.95 USD. Folsom Family History and Genealogy. PDF eBook English 14.8 MB. 1882. According to legend, upon the adoption of surnames in England there was a family who lived in the town of Foulsham for many centuries, who originated the family name. From the family of John Folsom this eBook contains over 265 years of vital names and dates, which stretch from the year 1615 to 1882. Up to 8 generations are listed with occupations, wills, romance, Sea Captains, military men, and a 17 page index listing over 1800 descendants! 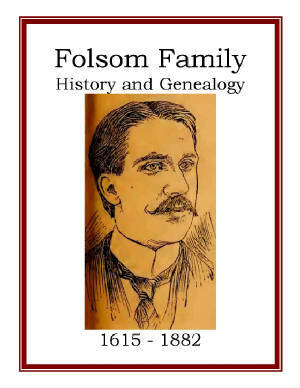 Truly this is a great resource for the Folsom family genealogist! Price $6.95 USD. 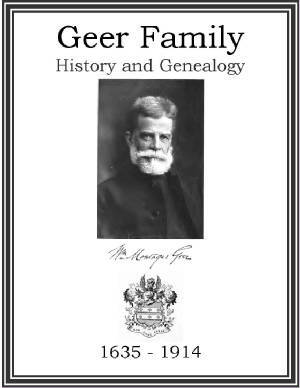 Geer Family History and Genealogy. PDF eBook English 12.6 MB. 1914. Vital dates and names of family members span over 275 years, ranging from the year 1635 to 1914 in this extraordinary history of the Geer family. There are Geer homestead photographs, numerous rare ancestral photographs, the family crest, 8 generations of descendants, and a 21 page index with over 2,200 names listed! 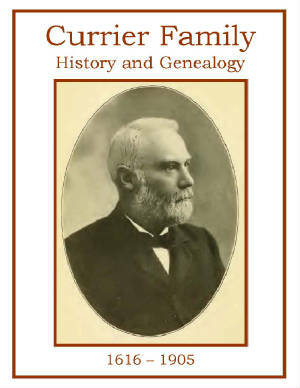 This is an magnificent resource for any Geer family member interested in the family genealogy! Price $6.95 USD. 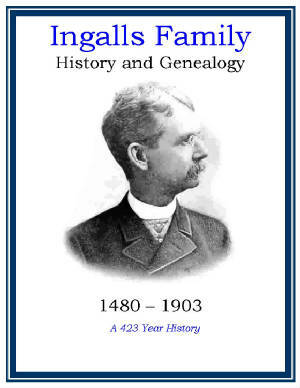 Ingalls Family History and Genealogy PDF eBook English 19.9 MB 1903. After 3,000 letters and 6,000 circulars were sent out this fascinating history of the Ingalls genealogy was prepared. There are numerous rare photographs, 9 generations of descendants, an American Revolutionary roster of family members, and an index of 39 pages listing 8,000 names of descendants and in-laws. Vital dates range from 1480 up to 1903… a 423 year history! The family arrived in the American New World eight years after the Pilgrims landed at Plymouth. An excellent genealogical reference for any family member! Price $6.95 USD. Marshall Family History and Genealogy. PDF eBook English 1.31 MB. 1922. 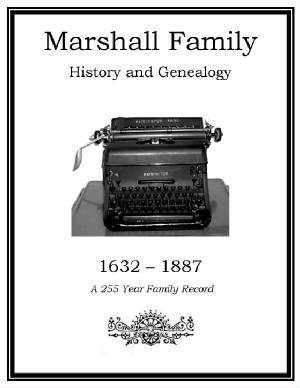 Around the year 1922 G. Marshall labored over an old Remington manual typewriter and compiled the family genealogy that extended back 255 years. These restored pages are from that typewriter and may contain information on the family tree not found elsewhere. This documentation extends from John Marshall of Billerica, Massachusetts, in the year 1632 up to 1887, and is densely packed with information into 10 pages. This great reference may feature rare genealogical information not found elsewhere! That's why it's here! Price $6.95 USD. 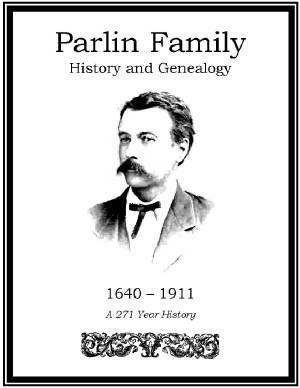 Parlin Family History and Genealogy PDF eBook English 19.0 MB 1913. This history of the Parlin family is rooted in the American Colonial era and extends from 1640 up to 1911… a period of 271 years! The family crest is presented; the tartan is shown along with the mourning sett tartan, and there is a 30 page index containing over 4,500 descendants and in-laws. Nine generations with essential names, dates, and short biographies are contained in this excellent documentation of Parlin forbearers. An essential resource for the family genealogist! Price $6.95 USD. 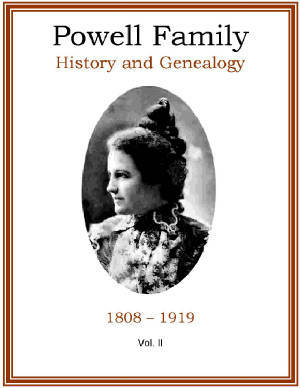 Powell Family History and Genealogy PDF eBook English 11.1 MB 1919. The genealogy of the Powell family extends from Thomas J. and Henrietta Powell from the year 1808 up to 1919. This excellent history includes over 50 rare ancestral photographs, homestead photos, letters, travel accounts, and vital names and dates of descendants covering a 111 year period. 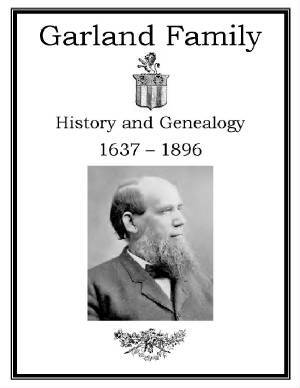 An excellent resource for the Powell family genealogist! Price $6.95 USD. 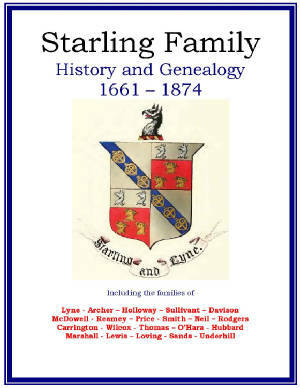 Starling Family History and Genealogy PDF eBook English 19.8 MB 1874. This incredible history includes the Family Crest, poetry, pedigree charts, and essential dates on descendants that range from 1661 up to 1874. A period of 213 years! There are details on 23 collateral families of in-laws as indicated on the book cover. This is a source of abundant information for the Starling family genealogist! Price $6.95 USD. Currier Family History and Genealogy. PDF English 11.7 MB 1910. The Currier genealogy begins with Richard Currier who lived in Salisbury and Amesbury, Massachusetts as one of the original settlers. Vital names, and dates, of at least 8 generations stretch from the year 1616 to 1905 with many documented Last Will and Testaments’ printed, brief biographies, and validation of Currier family members in the Colonial Army during the American War of Independence. This is an extraordinary reference for any Currier family genealogist! Price $6.95 USD. Garland Family History and Genealogy. PDF eBook English 17.3 MB. 1897. This book explores the family legend that the name originated in Wales prior to Peter Garland migrating to the American Colonies in the early 1600s. Over 250 years of family history with vital dates and names stretching from the year 1637 to 1896. There are 11 generations, several rare ancestral photographs, and a 32 page index of names with over 3,500 people listed! A great source of history and genealogy for the family genealogist! Price $6.95 USD. Grow Family History and Genealogy. PDF eBook English 16.2 MB. 1913. 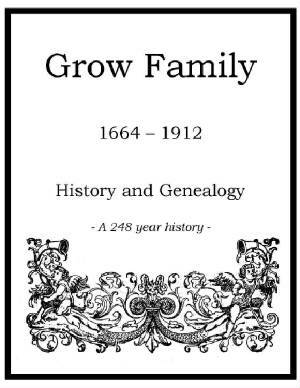 The Grow family heritage lives on in the pages of this book, and this legacy also refers to variations of the Grow name: such as Groo. The history includes John Grow of Ipswich, and John Groo of Oxford, during a period of 248 years. Vital dates range from 1664 to 1912 with up to 8 generations of descendants listed! An excellent genealogical reference for the family library! Price $6.95 USD. 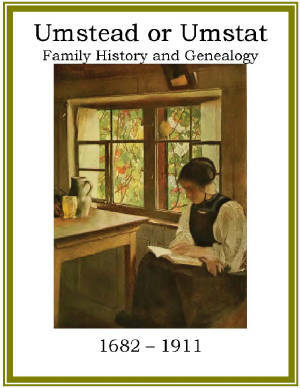 Luther Family History and Genealogy PDF eBook English 1.31 MB 1913. In 1644 a charter was granted to merchants of Boston to trade with the Dutch and Swedes at Delaware Bay. John Luther was a sailing Master and interpreter. After completing a trade a group of natives attacked and killed John Luther and carried off his son Samuel. Two weeks later Samuel was brought back to Boston. 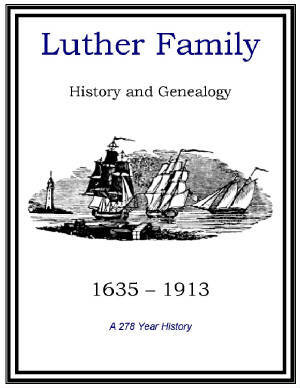 This eBook documents the Luther family genealogy that begins in 1635 up to the year 1913. Only 26 pages in length it is compelling and filled with essential dates and descendant information. A great link to the past! Price $6.95 USD. 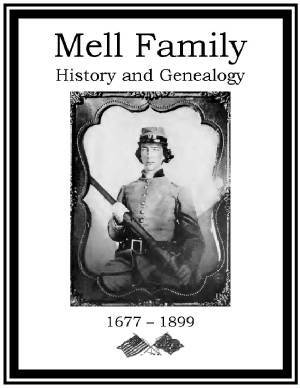 Mell Family History and Genealogy PDF eBook English 5.66 MB 1897. The facts in this history have been obtained from family bibles, old deeds, wills, and two land grants form the English Crown from 1677. Vital dates range from 1677 up to 1899, the family crest or the Arms of Mell is presented, and early tradition of the family being of Episcopalian and English Cavalier stock is validated. This book is a treasure of information that you will enjoy reading. It should be in the hands of every Mell family member who enjoys Southern hospitality. It is an excellent tribute to the Mell family legacy from colonial America times. A great source of genealogy! Price $6.95 USD. 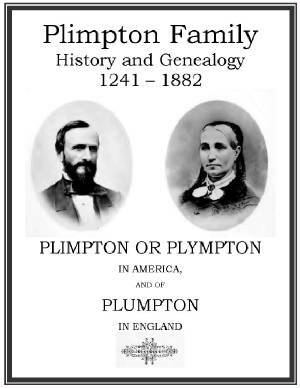 Plimpton Family History and Genealogy or Plympton Plumpton. PDF eBook English 15.0 MB 1884. A well written fascinating history with 21 rare ancestral photographs and etchings. Genealogy with vital dates and names range from the year 1241 up to 1882 with the 1st generation arriving in America during the colonial days, just before 1640. The family crest is printed along with a 12 page index of over 1000 names of descendants and in-laws. This is an essential reference that may extend your genealogy back several hundred years! Price $6.95 USD. 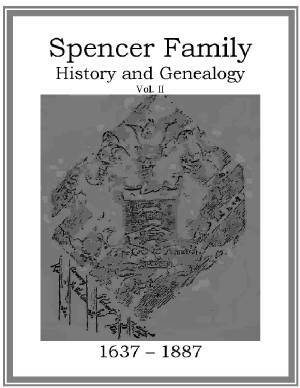 Spencer Family History and Genealogy PDF eBook English 1.38 MB 1889. A copy of the crumbling Spencer Coat of Arms is on the cover that was likely carried by sea Captain Spencer. Vital dates range from 1637 up to 1887 with family legends, short biographies, poetry, letters, and 6 generations of descendants. There are only 29 pages in this Spencer history, and unfortunately the acid quality of the paper has deteriorated preventing good quality of the photographs that this book contains. Yet, this reference may feature rare genealogical information not found elsewhere! That's why we carry it! Price $6.95 USD. Umstead Family History and Genealogy PDF eBook English .90 MB 1917. This is a transcription from the old German Bible which was brought to the American Colonies by Hans Peter Umstat aboard the ship Franoes and Dorothy on October 12, 1685. Typed by the author on an old Remington typewriter it is certainly a rare source of pertinent historical information for the Umstat Family, who changed their name to Umstead around the year 1780. Essential dates range from 1682 up to 1911 with descendant names, marriages, et cetera. Although only 4 pages in length it may feature rare genealogical information not found elsewhere! Price $6.95 USD.